0 - Whole; 120.8 x 90.2 cm; SIGHT DIMENSION. Signed and dated l.r. corner, black oil "Judy Cassab/ 1955". Signed top c. verso on frame, pencil "Judy Cassab/ ...". S.A. Parker Framing Works , 'Works in the collection with known Parker frames', pg. 27-68, Sydney, 2004, 66 (illus.). Heritage: The national women's art book , Sydney, 1995, 32 (colour illus.). cat.no. 49. Entry by Joan Kerr. Biography by Anita Calloway pg. 326. David Leser, The Australian women's weekly , 'The art and life of Judy Cassab', pg. 66-72, 277., Sydney, Sep 2003, 67 (colour illus.). 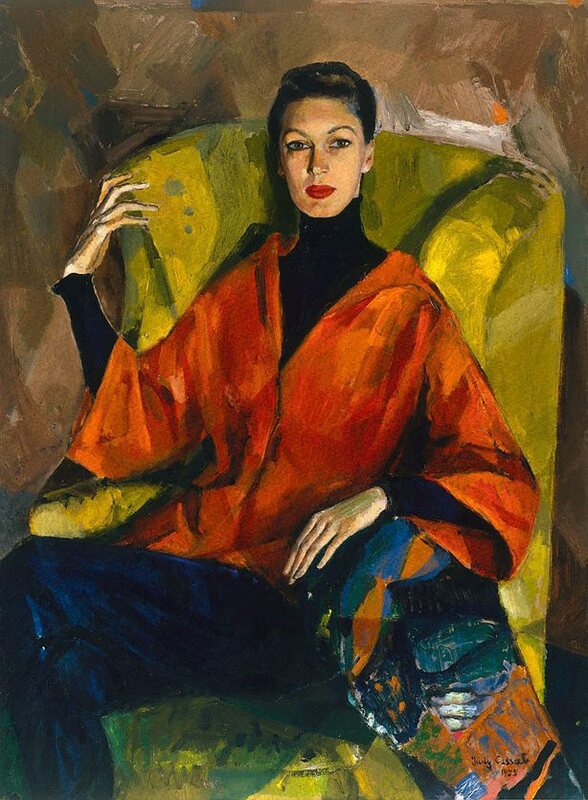 The front cover of the September 1955 issue of 'The Australian women's weekly', which reproduced this painting after winning the portrait prize, is reproduced here. Judith White, Look , 'An elegant woman', pg. 16, Melbourne, May 1999, 16 (colour illus. ).